Holidaymakers who choose to book a stay at Marari Beach Resort will get the chance to experience a fantastic break in a truly exceptional location. Set just back from an endless, quiet stretch of soft golden sand and surrounded by grounds of plush coconut palms, this resort is a real beach lover’s paradise. Accommodation comes in the form of pretty, thatched cottages, found scattered around the well-kept gardens which are teeming with beautiful birdlife and butterflies. During the day, the hotel’s large swimming pool is a peaceful spot to while away the hours, inviting you to take a dip and cool off from the hot Indian sunshine. The focus of this resort is very much on wellness, and with Kerala being the home of Ayurveda, there’s an Ayurvedic spa offering guests the chance to experience authentic local treatments. For yogis, Marari Beach Resort is ideal, with regular classes taking place within the stunning grounds and along the beach. Other activities such as tennis and cycling are on offer, so you can stay active or do some exploring during your stay if you wish. For those wishing to explore more of Kerala, the enchanting backwaters are just a short drive away, and a little further (approx. 1 hour’s drive) you’ll find the cultural city of Kochi. 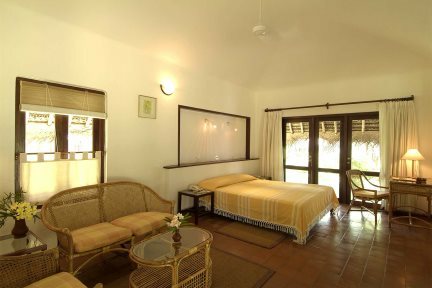 "Choose to book a seven-night or more stay in Kerala, or embark on a twin-centre holiday combining one of our beautiful hotels in Goa, the choice is yours". The Garden View rooms enjoy a terrace with views overlooking the gardens. They are comfortably decorated in a traditional Keralan style and have either double or twin beds and a bathroom with an open-air courtyard area complete with a banana or papaya tree.